Swan Towing Service has been a family owned and operated business since 1958. 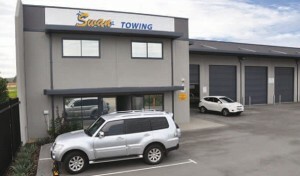 Owners Clinton & Zoe Hodge purchased the Swan Towing name in 1987 and have steadily built it from a small family business to the largest and most professional heavy recovery operation for car towing, truck towing & equipment of all sizes in Western Australia. Based in Midvale, Swan Towing services the entire Perth metropolitan area and all of country Western Australia. Boasting the latest, state of the art equipment with trained and police cleared drivers, Swan Towing Service can offer solutions for all your recovery needs. From towing the family car to a mechanic shop or recovering a road train from a remote regional location, we offer a comprehensive one phone call solution for any recovery situation. Our company prides itself in being a professional operation, and our aim is to provide a towing service which is far from the normal image of tow truck companies. We take our profession very seriously and expect a high standard of work ethic from our employees. You can be guaranteed that the highest level of care will be taken with your vehicle from pick up to drop off.